When the guys at French Touch Fishing add new products to their range of lure fishing equipment, it's worth a close look. At Nantes this year we discovered Tiemco for the first time. French Touch Fishing have added a selection of Japanese Tiemco tackle to their 2012 catalogue, alongside another of our favourites - Reins. 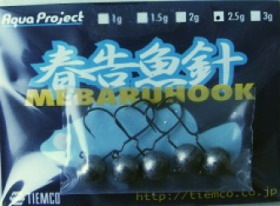 Of special interest to us were the new Aqua Project Mebaru Hook jigheads. A fairly average - but high quality - jig head if it wasn't for one small design feature - a U-shaped bend on the shank. My first impressions were that this was a simple lure retainer, designed to offer resistance to the lure and stop it from sliding down the shank. Indeed, this is probably the primary objective of the design but I really like the look of this design specifically to fish the Reins Rockvibe Shads. I fished the Rockvibe Shads throughout last year and they are certainly one of my favourite LRF lures, however they're so soft, they can have the tendency to rotate around the shank, harming the lures action. I don't like to use glue on small lures. The Rockvibe is actually wider in the body than it is top to bottom. This helps give the lure a great action and a nice surface area to glide/hang in the water column, but can cause rotation on the jig. Whilst this wasn't a massive issue and I still caught a lot of fish on them, I like the idea of fishing them on these Aqua Project MebaruHook heads to limit the chance of failure or impeded action. Quality is as you'd expect from a Japanese supplier - excellent. There's 5 in a packet and the weights range from 1.0g to 3.0g in half gram intervals. Very nice items. Very much looking forward to using them in the coming season.